Tiramisu is one of our absolute favorite desserts. It is even simple to make, you just need a little time. Jump to the full Tiramisu Recipe now or watch our quick recipe video showing you how we make it. Espresso soaked ladyfingers are layered with a light and airy filling made from mascarpone cheese, egg yolks and cream. 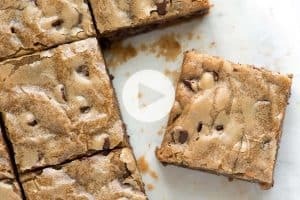 YOU MAY ALSO LIKE: Our Favorite Brownies Recipe. 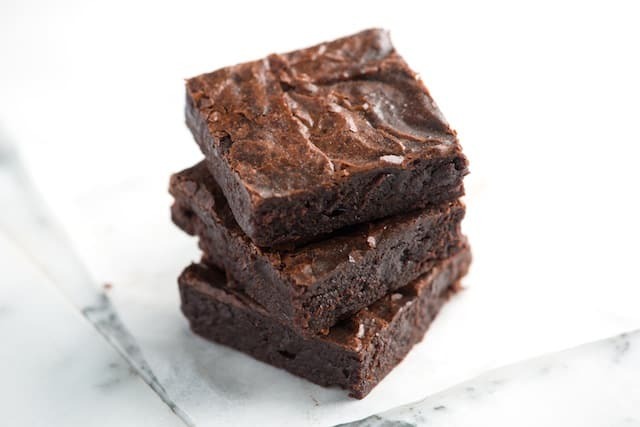 These rich, chocolate brownies with dense, fudgy middles and crinkly tops made us fall in love with brownies, made from scratch, all over again. Look for Italian ladyfingers (or Savoiardi). They are quite hard and often have a sugary top. Not to worry, though — they soften as the tiramisu sits. That’s why it is so important that you wait at least 6 hours before serving. In fact, it can be kept refrigerated 1 to 2 days and still be delicious. 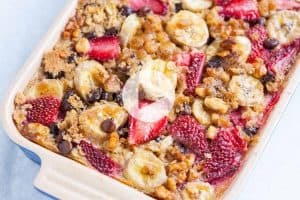 Use egg whites or cream? 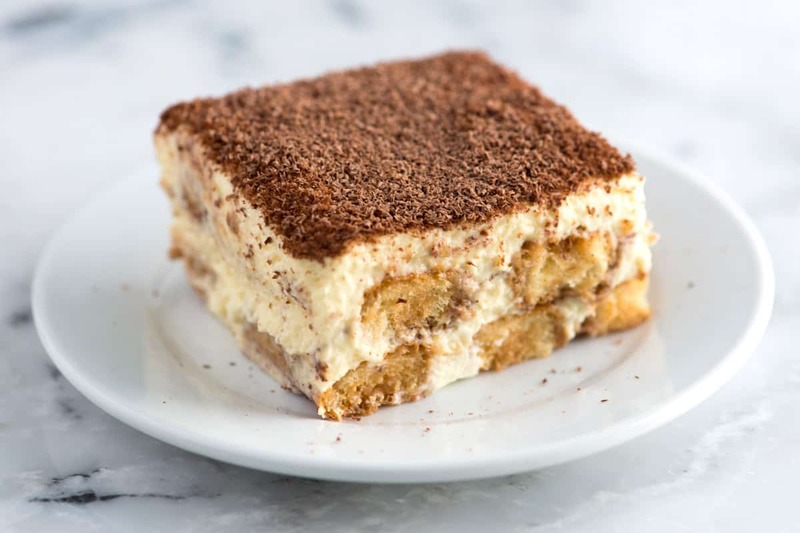 Look around for tiramisu recipes and you’ll notice there are two common ways to make it: with beaten egg whites or with whipped cream. Both are delicious, we promise. The decision is completely up to you (we’ve included directions for both below). They taste very similar. If anything, Tiramisu made with egg whites is a little lighter than one made with cream. The decision comes down to whether or not you’re comfortable with adding raw egg whites to the dish. We’ve never had a problem with this, but if you’re concerned, make sure you use the freshest (and highest quality) eggs possible. Or, make the tiramisu with cream. It really is just as delicious. You could also try making both then see which you prefer. 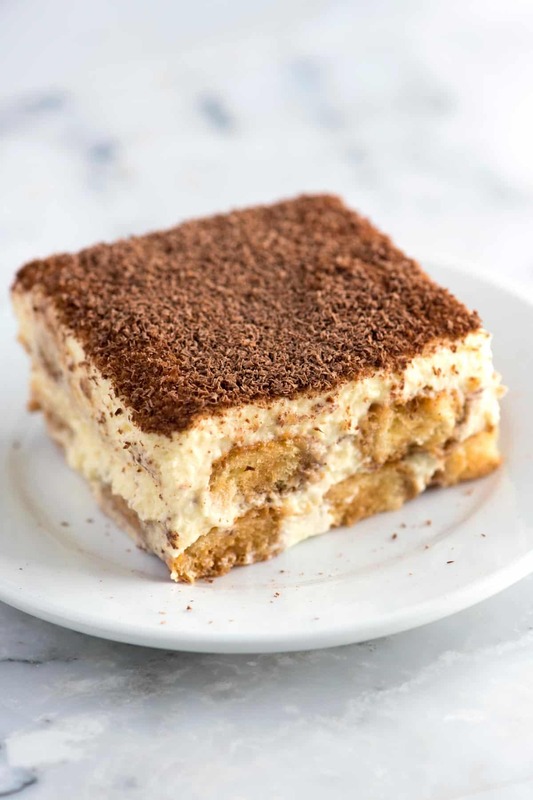 We just love this tiramisu recipe — it’s simple to make and boy does it wow at the dinner table. We call for egg yolks, which are cooked over a double-boiler and heavy cream. Instead of using the cream, some recipes call for egg whites which are left uncooked and whipped. In the notes section below, we have shared directions for using egg whites instead of the cream. There is little difference in flavor. If anything, tiramisu made with egg whites will be a little lighter than with whipped cream. Combine espresso (or coffee), 2 tablespoons of the Marsala wine, vanilla extract, and a tablespoon of the sugar in a wide bowl. Vigorously whisk egg yolks, 2 tablespoons of Marsala, and 3 tablespoons of sugar in a bowl set over a saucepan of barely simmering water until tripled in volume, 5 to 8 minutes. To make this step easier, use a handheld electric mixer at medium speed. (Do not stop beating until removed from the heat). Remove the bowl from heat then beat in mascarpone cheese until just combined. Dip half of the ladyfingers very quickly into the coffee, and line the bottom of a 9-inch square dish. 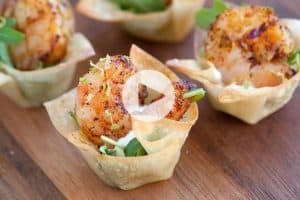 (You might find that you need to break a few into pieces to fit them in the dish). Spoon half of the mascarpone filling over the lady fingers and spread into an even layer. Grate half of the bittersweet chocolate over filling. 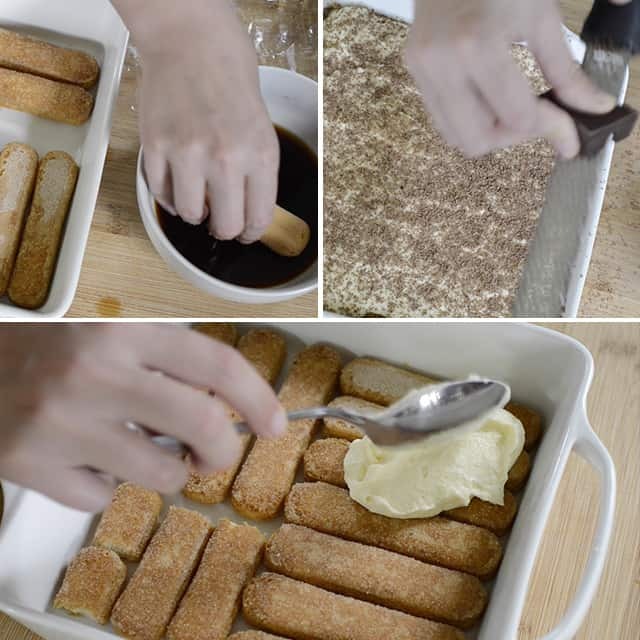 Then dip the remaining ladyfingers very quickly into the coffee and arrange a second layer over filling. When ready to serve, dust with more grated chocolate or cocoa powder. 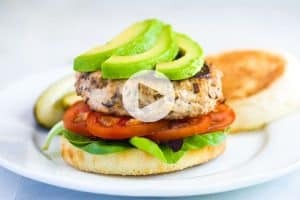 Leave out at room temperature about 20 minutes before serving. (Tiramisu can be chilled up to 2 days, but no longer or else the ladyfingers will break down and become mushy). Using Egg Whites Instead of Cream: Simply replace heavy cream with 3 egg whites. Beat the egg whites until they hold stiff peaks then gently fold in half of the beaten egg whites into the yolk-mascarpone mixture, then the remaining half just until fully incorporated. Assemble tiramisu as stated above. If you have concerns about raw egg whites, be sure to use the freshest (and highest quality) eggs possible. Look for clean grade A or AA eggs with intact shells. Substitutes for Marsala Wine: We love Marsala in tiramisu — it cuts the creaminess of the filling. For something a little different, try substituting dark rum, brandy or other liqueur. Since Marsala is less potent than something like rum, we suggest using about half the amount. For a non-alcoholic version, leave the Marsala out of the recipe all together or use rum extract. Best ever…..hands down!!!!! I changed a couple of things…I fully imursed the fingers in the espresso/marsella wine, vanilla & sugar using totally all of the liquid.. I just made another coffee/ marsella batch & repeated with rest of lady fingers…..OMG!!! Never again will I buy it…..really is not that hard!!!! THANK YOU for a wonderful recipe. I just used original recipe. I’m no cake maker or baker whatsoever however made this for the first time for a close colleague at work as she requested tiramisu and so I came across this recipe! Can I just say i nailed it! Followed the ingredients to the t and I also doubled it which served the entire floor. People were telling me they went for 2nd and thirds. I used thickened cream and no alcohol… although 3 people still asked lol :)) thank you so much for this recipe.